While I was visiting Cabo San Lucas with my family over Christmas, I decided to go on an adventure to visit Flora Farms. 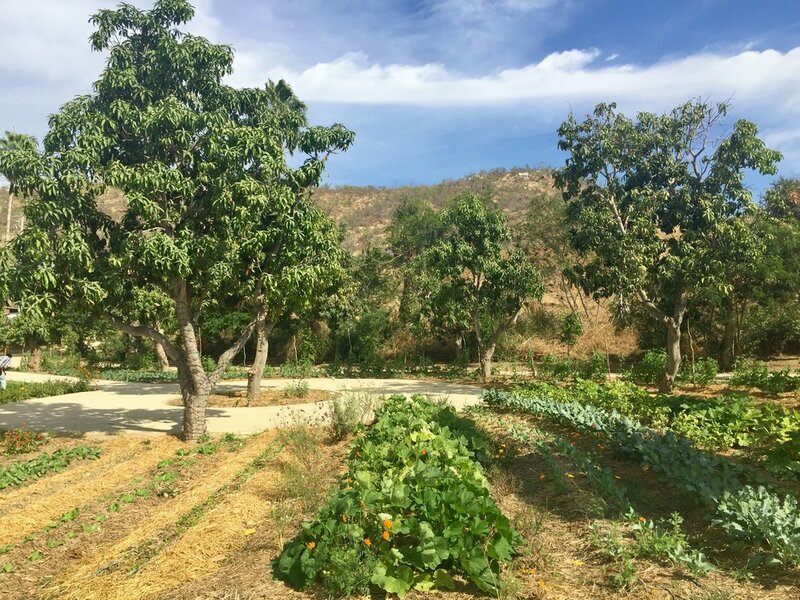 Flora Farms (aka paradise) is a ten-acre organic farm in the foothills of the Sierra de la Laguna Mountains in San Jose del Cabo, Mexico. I contacted their events manager, Erika, and she promptly invited us over for a tour! Please excuse my Iphone photos. When we first arrived at Flora Farms, we headed straight to the Flora's Farm Bar and I had one of the most delicious cocktails I have ever tasted! It was a fresh carrot margarita, adorably named a "Farmarita" and I was encouraged to bring it along on the tour with me (WIN)! Flora's Field Kitchen Cocktails: "Farmarita"
Beyond the fence, we discovered a beautiful and immaculately maintained garden where many of the larger Flora Farms weddings are hosted. I felt like I was walking through a painting. There are several areas where you can host a Ceremony & Reception. They have a full kitchen in close proximity to these areas. All of the produce and proteins served at the farm are grown or raised on the farm. The food is as fresh as it can get! As we toured the Flora Farms wedding venues, we bumped into a live painting class taught by a renowned artist. I felt like I was in a movie about paradise. An open air canopy of string lights. Picture this at night! We made a stop at the Flora Farms market and checked out their beautiful produce. They also have a bakery where they have a variety of fresh baked bread, pastries, and sweet treats. One of the best lunches ever! We also bumped into a fresh vegetable cooking class that was just about to get started. The scent of fresh grilled peppers filled the air. Once again, I felt like I was in a movie. Flora Farms was the best part of my whole trip to Cabo. It's a dream wedding venue and I would love nothing more than to plan a destination wedding for one of my Art & Soul Events clients. It's only a 2 1/2 hour plane ride from Los Angeles. That's basically how long it takes to get from Malibu to Downtown LA in traffic. So if you're searching for a wedding venue near Cabo San Lucas or San Jose del Cabo, I urge you to check Flora Farms out and email me at Info@artandsouleventsla.com. I promise that you will not regret it!